Last week when I did my series on handmade stocking stuffers I realized most of them were for toddlers. What about the babies? They need some handmade love too right? Don’t worry I whipped up something fun and festive for Baxter too. Sensory bottles! I had been saving clear plastic jars for awhile waiting for just the right craft moment. 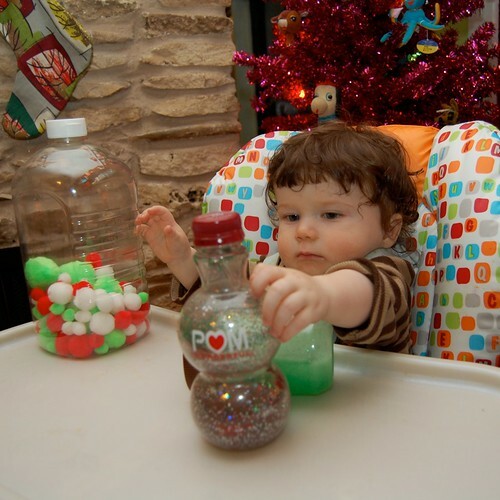 Seasonal sensory bottles were the perfect use for them. Fill your bottles with various items. I put red, white and green pom poms in one. Another had oil, water and glitter. The third was full of red, silver and green glitter. Once your jars are full add some tacky glue to attach the lids. We don’t want baby swallowing any pom poms. When the glue is dried completely park baby in front of the Christmas tree and watch him twirl and twist his new toys with delight. Not just for babies. 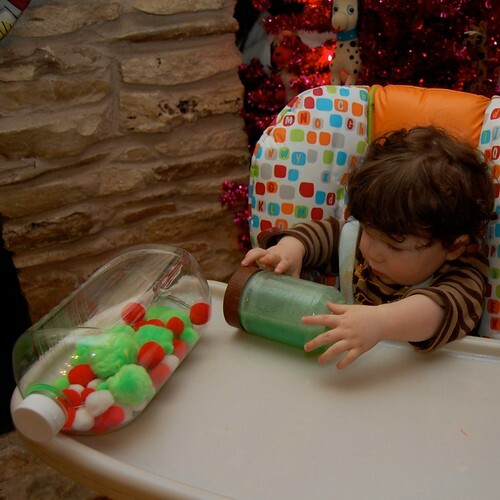 These sensory bottles were also a big hit with the toddler set. Posted December 23, 2011 & filed under Christmas, Crafts, I Love to Create, Kids, Kids Crafts, Recycled Crafts.